Did I regret my visit? Heck no, it's on my list for top nature travel (Norway still holds near and dear to my heart). People don't call it the land of ice and fire for no reason. It left me wanting more even if my wallet was like NAH. Here is how I spend my 3 full days in Iceland without going completely broke! Arriving at the airport, I bought a bus ticket (about $30) that dropped me off at my hostel. Reading about the food scene in Reykjavik, I was ready to eat sandwiches and pasta for the next three days. My grocery cost a total of $26. I met a fellow female traveler who was on her first solo trip. I joined her on a Northern Light tour ($90). For some reason, I signed up for the deluxe tour but there was a normal one for $64. Being on the mini bus, I knew why I paid more. Our tour guide shared tidbits about his country and gave us hot chocolate and blankets. We were lucky and caught the Northern Lights immediately. The tour guide lent me his tripod and even helped adjust my camera settings to capture the dancing lights. The Northern Lights were beautiful. Though, it was hard to enjoy the full experience because it was extremely cold and windy at night. I jumped out of the car to admire it for a second, took pictures, and tried to feel my fingers again back in the car. Visit in the winter when it's low season. Expect the weather to be unpredictable in the winter. I couldn't see the north because it would be too risky to drive. Save money on your flight and get a layover. I bought an one-way ticket from Germany to Newark with a 3-day free layover for $255 with Wow Air. Being a budget airline, luggages and carry-ons cost extra and food was not included. Save your water bottle and refill. Like I mentioned, save money by shopping at the supermarket. And, don't even think about buying water bottle. Tap water was safe to drink and not to mention top notch. It was delicious! Skip the Northern Lights tour - at your own risk. If seeing the Northern Lights is on top of your list, I might go with a tour because they know where and how to spot one. If you don't care for it, you can try to bum off a ride with a traveler. I signed up for another tour with the same company with my traveler friend. It cost $134 for 10 hours long, starting bright and early. It was worth it for the amount of sites I saw. But, I just can't with tour buses. I craved for the feeling of freedom. We were allotted only an hour here and it wasn't enough. Just getting close to the waterfall was a struggle because of the ice. It was super slippery so we walked by the edge near the rocks. The waterfall was unbelievable closed up. If that didn't wow you, the rainbow did the job. There was also a nearby staircase to reach to the top of the mountain. We were caught up taking pictures and didn't have enough time to check out the top. This might not be a tip for you but more for me. I never dress for the occasion. Make sure you have shoes with good traction. It will make walking much faster and safer. Icelanders are pretty chill folks. So when they warn you about something, you better take it seriously. The waves were extremely strong and fast so don't turn your back on it. Fatal accidents have happened here. Fun fact: The columnar rock formations below were the inspiration for Harpa concert hall and Hallgrímskirkja church in Reykjavík. It was a pleasant stroll on the lowlands but it was a lot harder when the road became icy again. I had to stop midway because I was afraid I'd fall and Idk end my life. There were people who came prepared with a tour group which provided proper equipment like ice crampons, axe, and helmets. Justin Bieber shot parts of his I'll show you music video here. I may or may not have listened to it on repeat on the way here. It kept me hype since it has been a long day. I could imagine it to be beautiful in the summer but I was ready to head back and call it a day. You can walk behind the waterfall and I would do it if it was summer. Some folks did it and got soaked. Who wants to sit on a bus for an hour in wet clothes? NAH, I'm good. Unless it is your last option - don't book a tour. For the price you're paying, it is fair for all the sites you'll see. But, it just wasn't the personal experience that I craved for. My advice is to to rent a car if you're with a group of people or start chatting up travelers with cars. Carpool instead. My trip was last minute so I didn't have anything planned but you can try a carpooling app to get a ride. I heard it's fairly active. Hitchhike at your own risk. When it's summer and warm enough to wait on the road, hitchhiking can be an option as Iceland is one of the safest countries in the world. Their cops don't even carry weapons on them. 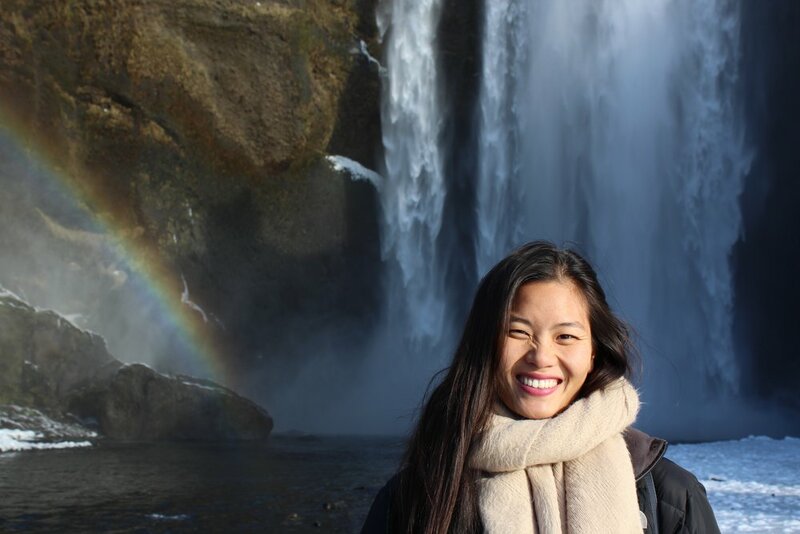 I would have not enjoyed my Iceland experience if I went on another group tour. I wanted to recreate my Norway experience in which I stopped wherever and whenever I wanted. I was so glad I met Paul at the hostel. He was looking for someone to lend him a charger and take crazy pictures of him. I can do both. I mean👇🏽. Yeah. A designated UNESCO site, Þingvellir National Park is the meeting point of two tectonic plates - the Eurasian and North American. You can even snorkel the Silfra, a deep fissure that has formed between the two plates. It's like that scene from A Walk to Remember. The guy fulfilled Mandy's character goal of being in two places at one time. Except, way more EPIC. You get to dive between two continents! Like the stank from the shower water, the Geysir will smell like rotten eggs. But, don't worry. Hot and cold water comes from two different sources. Cold water comes from natural springs while hot water smells like sulfur because it comes from geothermal power plants. We watched the Geysir exploded all high and mighty without any warning. Just make sure you can run fast enough so you don't get hit by it. Final Stop: Brúarfoss Waterfall but first... Horses! Yup, seeing Icelandic horses was on the top of my list. Look at them! They are such cuties with their hair blowing in the wind. Just be patient when you see the horses far away. They will walk toward you. Fun Fact: If Icelandic horses leave the country, they will be forever in exile because they are not immune to certain diseases. Also, if you don't want to insult an Icelander - never ever call their horses a pony even if they look like one. Horses are respected animals for Icelanders. The typical Golden Circle stops at Gullfoss waterfall. We were running short on time so we skipped it and checked out Brúarfoss instead on our way back. Wow, we were not disappointed. Because it's not a main attraction, we got the whole place to ourselves. It was exactly what I was looking for - that freedom feeling. Before I even booked a stay, I made sure I got a spot at the Blue Lagoon. I've seen too many turquoise pictures to miss my chance. I snatched the last spot at 8AM. A little treat for myself on my last day. There were 4 different packages. I got the most basic package that cost $110 (including transportation). Make sure to pack a towel and flip flops. Before entering the spa area, everyone needed to shower without their bathing suits on. There were open stalls and showers with doors for shy folks like me. The sulfur water was harsh on my hair so I made sure to lather on loads of conditioner provided by them. The spa was huge with a mask bar, an actual bar with drinks, a waterfall, an indoor resting area, two steam rooms, and a sauna. Depending on the content of the mineral, the water might change color. On the day I went, it was a bit more greenish than the turquoise blue. Nonetheless, I felt very relaxed. Fun Fact: The Blue Lagoon is not a natural wonder. It's wastewater from the nearby geothermal plants. The water is natural and clean but there was never a pool here before. Thanks to some marketing geniuses, this has become a top Icelandic tourist destination which is also why you wouldn't find any icelanders here. Because, well... they go to actual natural pools. 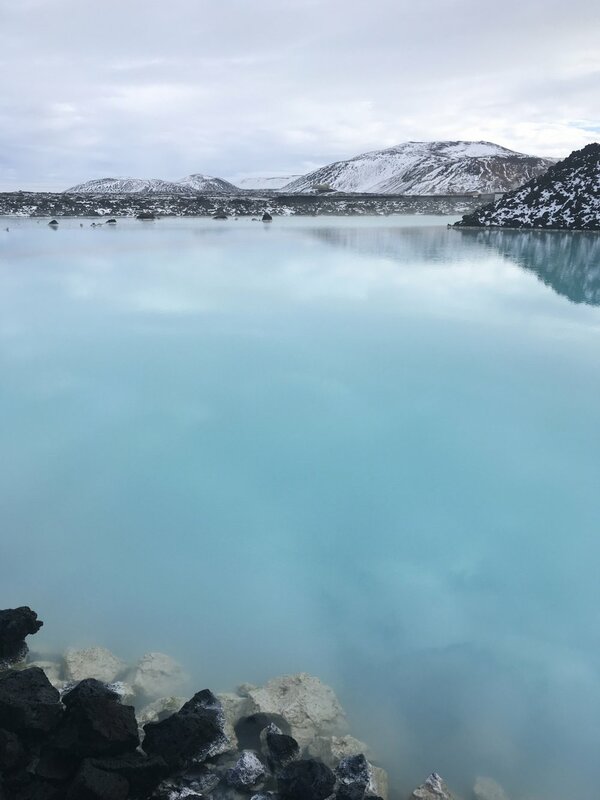 Visit the Blue Lagoon either before your departure or after you land because it's on the way from the airport to Reykjavík. If you can't reserve a spot or don't want to spend all that money, try the 17 public pools in Reykjavík. I went to Laugardalslaug. It has a huge heated pool with basketball hoops, slides, and hot tubs. The facility was clean and cheap, costing me only $10. It was a great spot after a long day. I didn't spend enough time in Reykjavík to recommend good spots. Many of the restaurants and souvenir shops were super expensive. Hot dogs were a thing in Iceland. I got one at Bæjarins Beztu Pylsur - where even Bill Clinton stopped for one. Icelandic hot dogs ($4) tasted different because it was lamb meat topped with fried and raw onion, ketchup, sweet brown mustard called pylsusinnep, and remoulade (a sauce made with mayo, capers, mustard, and herbs). Did Iceland live up to the hype of being the It country at the moment? Absolutely! Maybe because of all the pop culture references, free layovers, or a good marketing team, Iceland's tourism industry shot up from 16 to almost number one. 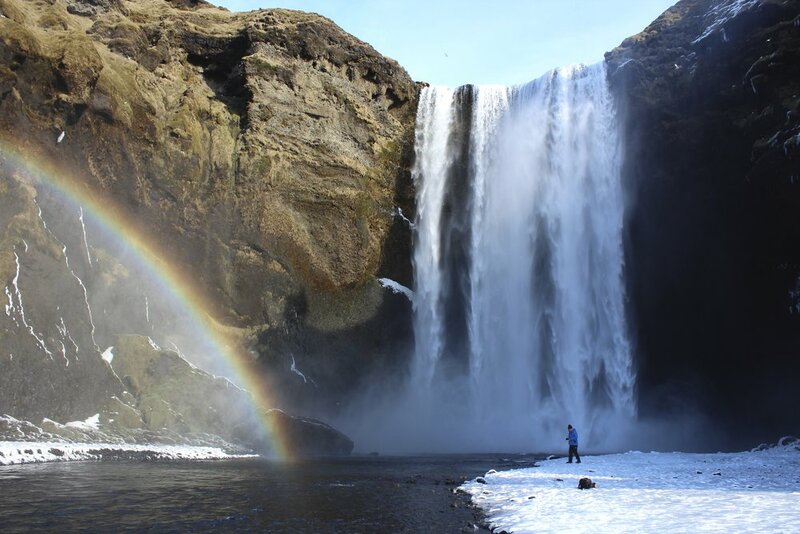 Anyone can see why because of the extreme landscape, magical waterfalls, and chill out Icelanders. Is Iceland on top of your travel list? Let me know in the comments below what you want to see or your favorite thing about iceland?